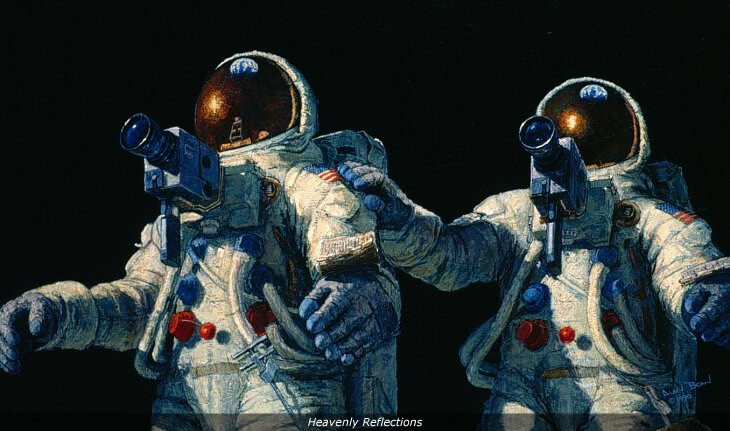 I have painted Pete Conrad and myself 239,000 miles from Earth, standing on the Ocean of Storms, looking homeward. Pete and I had come a long way together. We had met some ten years before. I was a student in Navy test pilot school and Pete was one of my instructors. I admired him for his professional skills and for his relaxed, colorful attitude. He is the best astronaut I have ever known. It was incredible to be standing on the Moon with him. It was good to take a moment to reflect on all the dedicated people it took to get us here for America. We were the lucky ones. The stars were not visible because the sunlight reflecting from the bright lunar surface caused the irises of our eyes to contract, just as they do on Earth at night when standing on a brightly lit patio. As we looked up, the sky was a deep, shiny black. I guessed that deep, shiny black was the color one sees looking into infinity. As I touched Pete's shoulder I thought, can all the people we know, all the people we love, who we've seen on TV, or read about in the newspapers, all be up there on that tiny blue and white marble? Earth is small but so lovely. It is easily the most beautiful object we could see from the Moon. It was a wondrous moment. If there is a God in heaven, this must be what he sees as he looks toward his children on the good Earth.